During candy and cough drop production, the material is in a plastic state. It must flow and be shaped by stamping machines. If the presence of excess moisture causes the material to become sticky, it will not flow freely and it will adhere to the stamping machine. To eliminate this material and equipment problem, dry the surrounding air. Make-up air specified by owner – 350 cfm. To determine the size of dehumidifier necessary to maintain the desired controlled space conditions. The door is adequately weather stripped and is of standard construction. Ten workers in the area maintain a moderate pace; each requires ventilating air. The interior of the control space is constructed with two coats of vapor barrier paint. There are no other openings in and out of the controlled space. All physical cracks are sealed. A vapor barrier is provided in or under the concrete floor. pound from standard Psychrometric chart. Therefore, 121 – 46 = 75 grs/lb. At a db of 75° F and working at a moderate rate, a person will expel 2,540 grains each hour. Note that 350 cubic feet per minute (cfm) outside air is based on a requirement of 30 cfm for each of 10 workers is introduced at the dehumidifier. The effect of this air on the ultimate de­humidifier size will be handled below. S = 46 = Grs/lb moisture requirement of controlled space. In the absence of a ventilation requirement this would be the inlet condition at dryer. From the above calculation the space moisture load is 187,778 grs/min. 1369 cfm air at 14 grs/ Ib will maintain the space design conditions. At this stage in the procedure, it is necessary to resort to the method of approximation to select the correct dryer. In addition to handling the space load the dryer must handle the moisture load contributed by the 350 cfm outside air requirement. So use a 2000 cfm Bry-Air Dryer (MVB-20-C). The following worksheet is a demonstration of what the calculations will look like. In the above calculations, moisture gain or air leakage in the process duct-work was not considered. If, however, the process and return ductwork did contribute to the moisture load, the total duct volume would be an additional space. Then the permeation calculation in Part Four would be used: V = duct volume; C = 14; F, from Table II, with moisture difference ~G measured from inside process air duct to surround ambient; F3 for tight, good commercial ductwork = 0.6. Add the resultant moisture gain to the room total load. A nominal allowance for process air lost due to duct leakage = 5%. Selecting a VFB™-24- at 2000 CFM is the best choice for the hard candy manufacturing example. While it may seem to be an oversized selection, consider that all desiccants in all manufacturers’ desiccant dryers will age, will possibly become physically and chemically contaminated with dirt, dust, or chemicals, and will gradually lose their effectiveness. Fortunately, with the VFB™-24, higher levels of moisture in the leaving air-up to 24 grs/lb dry air-could be tolerated prior to a desiccant change. So what appears to be an oversized selection would actually allow much longer use of a desiccant charge and provide the economies of longer use. Moisture damage in a standby or storage warehouse can be avoided by surrounding the machinery, equipment, or material with dry air. Problem To determine the size of the dehumidifier required to maintain standby conditions. All physical cracks are sealed and the floor properly vapor-proofed. If the room is completely vapor-proofed, use Table 4 on page 8. * External application is recommended because: Outside walls are usually easier to access than inside walls for paint application. Coating the outside walls discourages water permeation into the wall and thus minimizes water accumulation in the wall structure itself. The Permeation Load is the only moisture load involved in this example. ∆G = 58 grs/lb. Outside design web bulb of 77°F gives 130 grs/lb from Table I (LINK) Controlled space requirement of 85°F db, 40% rh yields 72 Grs/lb from a standard Psychrometric chart. Therefore, 130 – 72 = 58. F2 = 0.24 from Table III – extrapolated as straight line for a volume of 1,663,200 cubic feet. Refer to schematic blow which shows the load requirements and drying system. S = 72 = grs/lb moisture requirement of controlled space. G = grs/lb of air leaving dryer. Enter curve at 72° “Inlet Moisture Condition”. Interpolate “Inlet Air Temperature Curve” between 75° and 95° and find “leaving Moisture” at 33 grs/lb. Therefore, 11,427 cfm of air (33 grs/lb) from the dehumidifier is needed to maintain a grain level of 72 grs/lb. In a building of this size and shape, air distribution ducts are practical for effectively spreading the air so it can return to a common point and re-enter the dehumidifier. 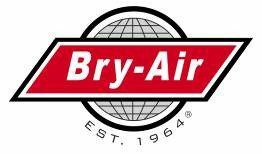 Recommendation Use one Bry-Air VFB™-150 Dehumidifier at 12,500 CFM in this standby warehouse example with a fan sized to handle the necessary static pressure of the duct system. Here we have a room used to remove water vapor from such products as cattle feed mixes, nylon or rayon cord for tires, raw plastic material, granular chemicals, raw paper stock, cardboard stock for coatings, or other similar products. In this example, the room is used for drying cattle feed mixes, which are contained on drying carts that stand in the room until the specified level of dryness is attained. Space condition requirements and product movement rate are determined by the manufacturer. There are no other openings. Product enters room at 8% moisture and leaves at 4% moisture. 9. Drying room wall construction – 8″ masonry. 350 cfm outside air required by manufacturer. Problem To determine the size of the dehumidifier. The double door is weather stripped. Two coats of vapor barrier paint have been applied to the wall and ceiling construction of the drying room; the floor is suitably protected against vapor permeation. 1500 lb./hr × (8 % – 4%) = 60 lb./hr water removal Since one pound of water equals 7000 grains, then: 60 × 7000 = 420,000 grs/hr product load. Note that the time needed to reduce the material to a 4%moisture level would have to be given or experimentally determined. These data would determine the amount of material to process and the size of the drying chamber needed. ∆G = 77 Outside design web bulb of 73°F gives 113 grs/lb. Drying room space Requirement of 95°F,15% RH yields 36 grs/lb from a standard Psychrometric chart. F1 =1.99 from Table II – Factor for moisture difference of 84 grains. F1 = 1.99 from Table II – Factor for moisture difference of 84 grains. The 350 cfm outside air requirement will be considered at a later stage in the calculation. S = 36 = grs/lb drying room controlled space requirement. In the absence of an outside air requirement this would also be the inlet condition at dyer. G = 15 grs/lb – equals condition of air leaving dryer. Enter curve at 36 – intersect 95°F curve at 15 grs/lb. 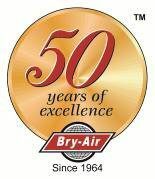 Recommendation The Bry-Air VFB™-75 Dehumidifier, rated at 7500 cfm, should be adequate. However, the first step should be to determine if this Dehumidifier has enough capacity to handle the 350 cfm outside air in addition to the moisture load in the drying room. Reference to Chart 1, Appendix 4, shows that air entering the dryer at 39.5 grs/lb. would leave at 17 grs/lb. The computed moisture load is 592,581 grs/hr. Therefore, the VFB™-75 is adequate to handle the moisture load. Many air conditioned manufacturing areas often have a required air flow to handle a sensible load in that space. This air quantity requirement and the accompanying dehumidifier size are usually greater than those needed to handle a latent load. By designing a system for the sensible load situation and then determining the appropriate dehumidifier to handle the moisture load, the desired conditions for the space can be maintained. Controlled space requirement – 55°F db; 30% RH; 20 grs/lb. Air available for make-up – 50°F db/49°F wb; 50 grs/lb. Problem To determine the size dehumidifier needed in a controlled humidity and temperature area. F1 = 2.76 from Table II – Factor for moisture difference of 110 grs/lb. F2 = 0.48 from Table III – for 48,125 cu. Ft.
F1 = 2.76 from Table II – Factor for moisture difference of 84 grains. F1 2.76 from Table II – Factor for moisture difference of 84 grains. A = area, 2.8 sq. ft. The total room latent moisture load is 479,802 grs/hr, which is added into the calculation below to find the entering grain condition needed for the space. Thus the air to the room must be 15.4 grs/lb. and the air mixture (return from the room plus the dehumidifier discharge) entering the main system fan should be 15 grs/lb. to allow for possible leakage into the system duct work. Here one must resort to trial and error techniques to select the dehumidifier size. G = 4 grs/lb. air leaving dehumidifier with entering air 53°F, 30 grs/lb. Note that the make-up air of 2400 cfm must mix with 5100 cfm of return air before entering the dehumidifier. Recommendation The VFB™-75 Dehumidifier will satisfy the room load conditions when mixed with the remaining 17,215 cfm of return air and delivered into the conditioned space. Many applications require a specific quantity of outside air to be delivered at a given moisture content and temperature. This requirement may be a need to make up air exhausted from a space or to supply air for a process such as a drying oven. From the Typical Performance Curves chart it is obvious that 130 grain air cannot be reduced to 17 grains in a single pass through a dehumidifier, without other conditioning. Examination of Chart 1 shows that to produce 17 grains air leaving the dehumidifier, the inlet condition should be 64 grains or less at 60°F or less. This is accomplished as shown above by installing a cooling coil upstream of the dehumidifier to reduce the temperature and moisture content of the outside air. In most water pumping stations, filtration plants, and wastewater control plants, control of humidity in the pipe galleries, pump rooms, and control rooms is of prime importance. By reducing the dew-point temperature of the air below the temperature of the piping and walls, sweating and condensation can be eliminated. By circulating warm, dry air through the areas, water accumulation is avoided, maintenance for electrical controls, motors, and instruments is reduced, and paint lasts longer on the pipes, valves, and flanges. The use of an after-cooling coil for the dry air discharge from the dehumidifier can be omit­ted in most installations since the warm, dry air (low rh) will help heat the space during cool or winter conditions. Heat should not build up to an objectionable level because the large piping and wall areas are at the same tem­perature as the water in the system. Warm air also has the advantage of reducing the rh and increasing the air’s capacity to carry away moisture.